Jahanshahi, M. (2016). Foreword. Journal of Water and Environmental Nanotechnology, 1(1), 0-0. Mohsen Jahanshahi. "Foreword". Journal of Water and Environmental Nanotechnology, 1, 1, 2016, 0-0. Jahanshahi, M. (2016). 'Foreword', Journal of Water and Environmental Nanotechnology, 1(1), pp. 0-0. Jahanshahi, M. Foreword. Journal of Water and Environmental Nanotechnology, 2016; 1(1): 0-0. Richard Feynman was the first scientist to suggest that devices and materials could someday be fabricated to atomic specifications. Later the term nanotechnology was coined. Today nanotechnology is reshaping technology. Nanotechnology is not only a part of future, but is all of it. Mankind history has always experienced waves of growth and development which affect societies, chances developed by mankind and employed to enhance the life quality and create wealth. Nanotechnology is one of these waves emerged to make a superior future. Nanotechnology is a group of emerging technologies in which the structure of matter is controlled at the nanometer scale, the scale of small numbers of atoms, to produce novel materials and devices that have useful and unique properties. Some of these technologies impose only limited control of structure at the nanometer scale, but they are already in use, producing useful products. They are also being further developed to produce even more sophisticated products in which the structure of matter is more precisely controlled. The nanotechnology community thus focuses on applying these developing technologies to solving important world problems. Although more than 70% of the earth surface is water-covered, about 97% of the world water (by volume) is too salty for drinking, irrigation or industrial use. Forecasts to 2030 indicate an increase in global water uptake at about 40% of the current accessible and reliable supplying sources, meaning an intensification of water consumption. In addition, one of the most important issue for living things is environment. Its pollution is mostly a direct result of human activities on the earth. Air, water and soil pollutions are big problems which threatens the life on the earth. To meet environmental challenges of the future in a sustainable way, for instance, wastewater must be acknowledged as a renewable resource for water, energy, nutrients and other materials. As the water sector looks to face the new challenges with innovative solutions that protect the environment, public health, and global sustainability, minimizing use of resources and maximizing the recovery of resources from wastewater is destined to become the focal point. Stringent permits in developing countries and resource constraints (especially electric power and chemicals) in developing countries demand energy-neutral wastewater treatment and resource recovery where practicable. There are already many innovative approaches and technologies that are adapted for the urban environment, which often requires intensified treatment. While these forms of treatment are becoming important everywhere, they are critical for resource scarce urban centers in the world. From these points of views, Nanotechnology can play an important role one way or another. In the other words, nanotechnology can be devoted to water and environmental technologies, nanosafety, monitoring studies and management as well. However, the mutational basis of environmental effects involving with the nanotechnology are important too. Nanoscale science and technology relevant to water and environment, risk assessment activities and regulatory policies on issues of environmental and human health and nano-focused water and environmental research as well as environmental mutation area, are the parts that need to be taken to account. 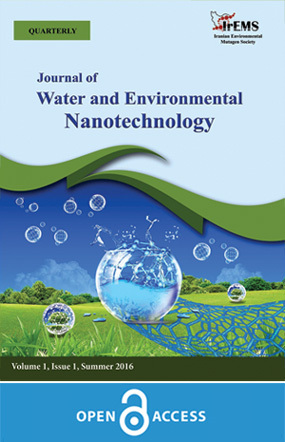 We are very pleased to announce the first issue of the Journal of Water and Environmental Nanotechnology. The journal is intended to provide state-of-the-art expositions of latest advances by theoretical, numerical and experimental studies across the spectrum of the field, from scientific enquiries to practical applications. I would like to express my sincere appreciation to the editorial boards, scientific advisors, both the authors and the reviewers, for their kind support and seek the continuous promotion for making the Journal one of the most successful and pioneer academic media in this vital field.